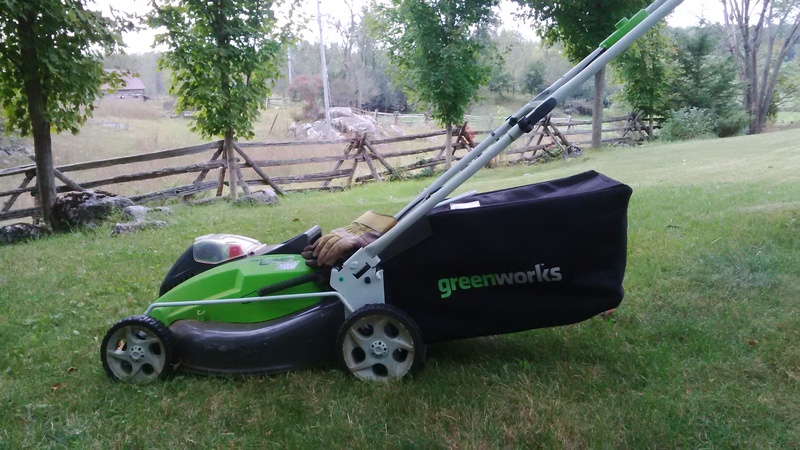 It’s only since moving to my little two acres, with a big patch of cleared greenery to mow, and a Greenworks battery-powered mower to do it with, that I’ve started thinking of my lawnmower as a vehicle with whom I have adventures. But I haven’t known what to call this companion. 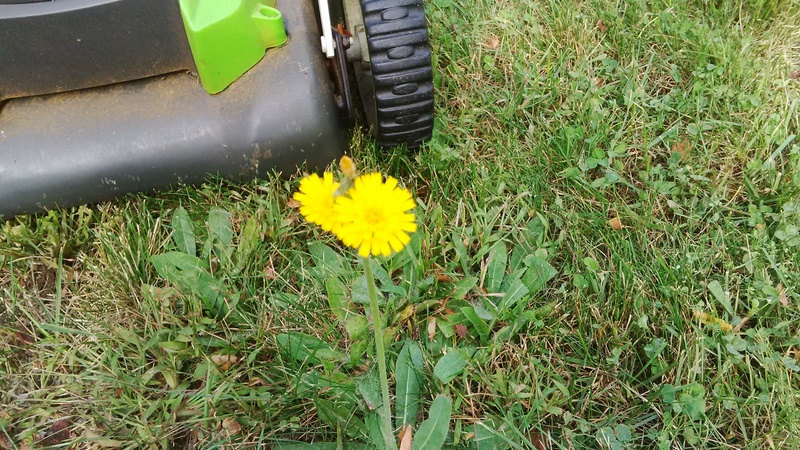 Until the other day, heading out to mow for the fourth or fifth time in a week, and realizing that I was looking forward to it, I thought, “the lawnmower and I have a bit of a thing going on”. So let me tell you about today’s adventures, mine and Mrs, Jones’. We avoided the usual batch of smartly hopping frogs, crickets, cicadas, spiders, and moths. We did not avoid the desiccated wild cat poop but as it was dried, no matter. (No photo, you can picture it yourself.) We cut down a goodly number of nascent wild parsnips but they were not in flower so we’re simply keeping them at bay, not spreading them around, according to what the provincial ministry of the environment’s website tells me. We collected grass clippings for the compost – this is heavy work, and pushing Mrs. Jones and her bustle full of long grass along the sloped lawn makes me think I can cancel my gym membership. 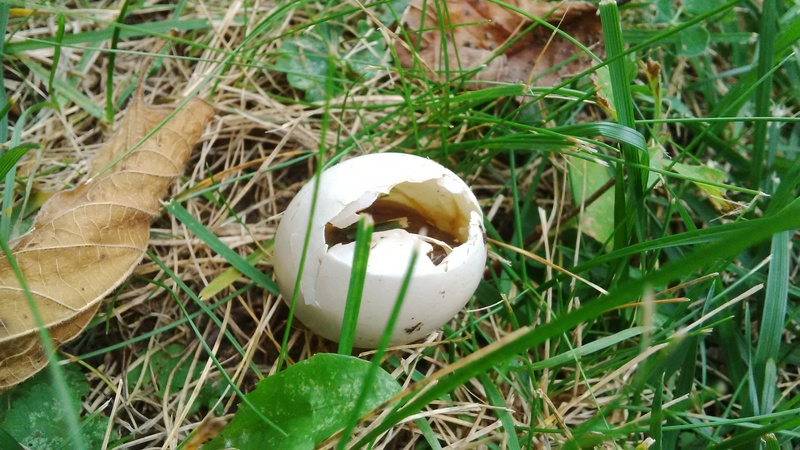 We found an egg, broken open, with remains inside. 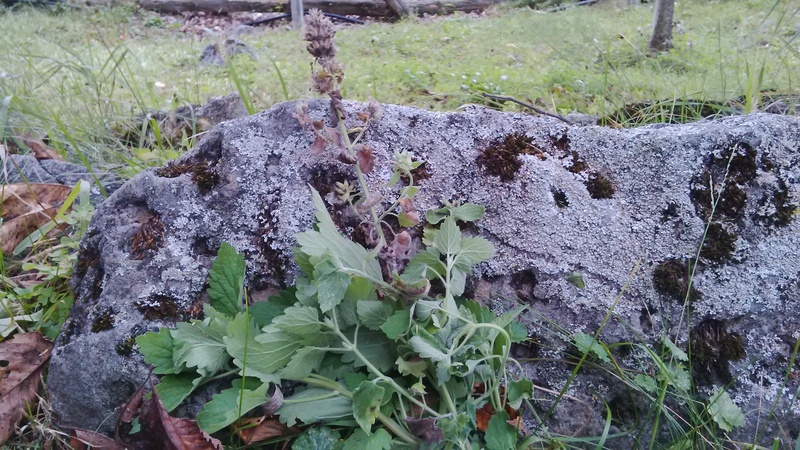 We found wild catnip, which I harvested for Hazel and Mabel. 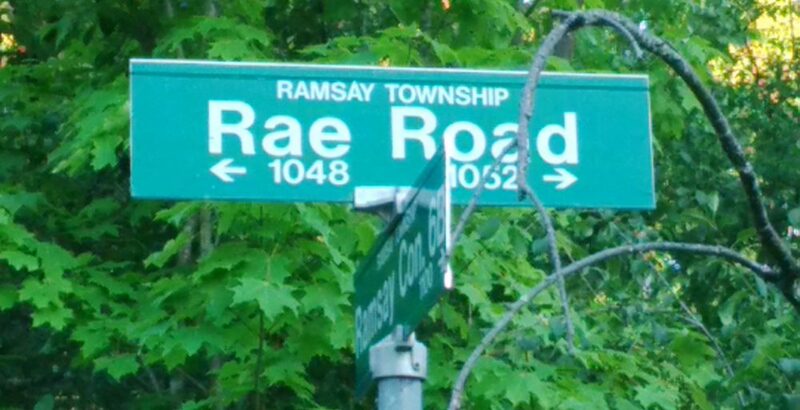 For the go od of us both, I wrestled and snipped out several stands of wild raspberries, which Mrs. Jones finds impassable. 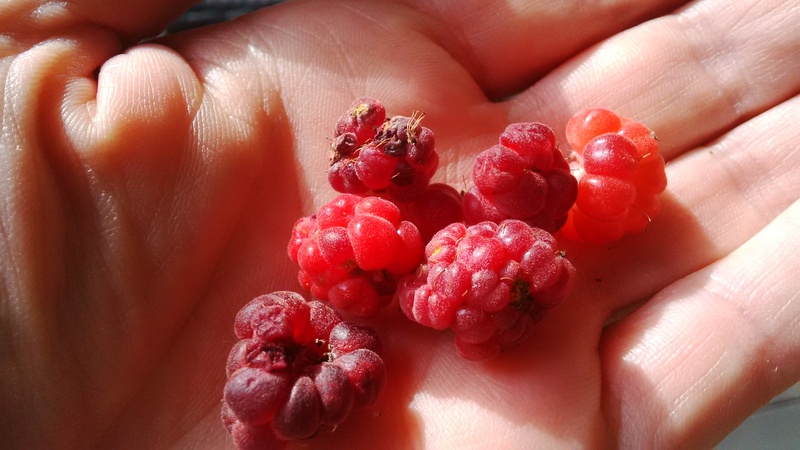 Wild raspberries have whip-like, pliable stems, up to ten feet long, that start new roots when their tips reach the ground. 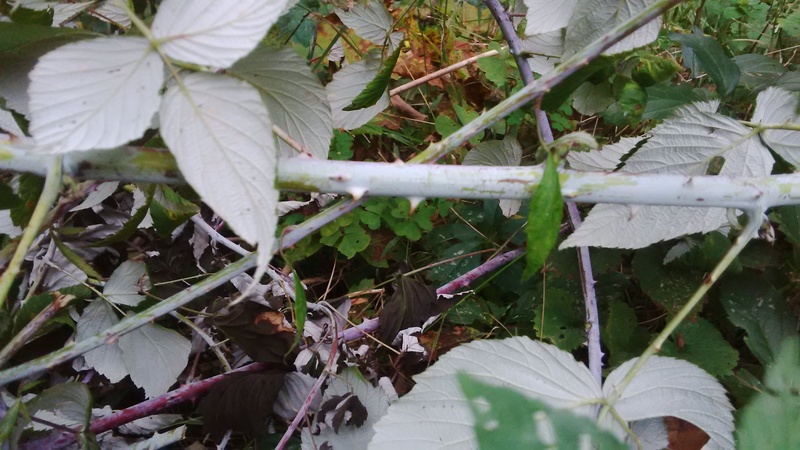 They may not look like much in the photo, but they also have wickedly clever thorns that hook and slice human skin and foam rubber handles with equal ease. We picked six domesticated raspberries, the whole harvest from the plants sweetie transferred this Spring from the city house. I fed these to sweetie. We left a few wildflowers here and there to brighten the lawn. And just before the rain, we found a patch of lemon-scented moss with a teeming colony of winged ants, that reminded me of Coalescent, by Stephen Baxter. So what does it matter, these adventures Mrs. Jones and I have together? I’m surprised at how much I like mowing the lawn. I tend toward non-intervention, wanting to leave things to themselves. My brother says I used to protest shovelling because it ruined the smooth look of the snow. 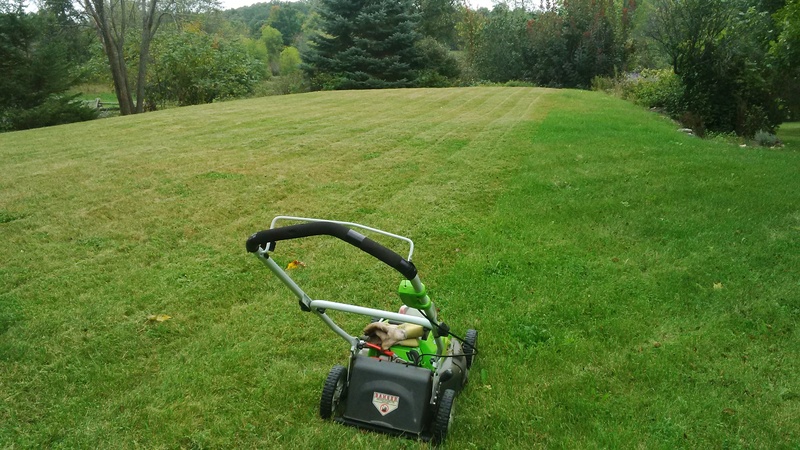 But to some extent, mowing must be done, and it’s a physically exerting but intellectually easy job, one I understand. I know when I’ve done it well, and I know when it’s finished. Mrs. Jones is like a horse who knows the path, and I can almost just follow along. I’m outside, I’m moving, I’m getting to know the world around me, and I can hear myself think. I can hear the birds, I can hear the sheep, and the mower doesn’t scare them off. I can take a break over the rail fence to nuzzle Alpha, the elderly horse who boards with the sheep. Alone with my thoughts, yet interacting with my environment, mowing is not quite a meditation, but a way of coming alive. My friends say, get a ride-on mower. But I’ve got my thing with Mrs. Jones.